Musical training influences sound processing in the brain through learning-based processes while also enhancing lower-level acoustic processing within the brainstem8. Behavioral and physiological evidence suggest there is a critical period for pitch processing refinement within these systems between the ages of 7-to-11 years.9-13 The purpose of this project was to determine the contributions of musical training and age to refinement of pitch processing beyond this critical period. Individuals with extensive and active instrumental musical training were matched in age with individuals with limited instrumental musical training. This comparison served as a baseline to evaluate the extent of presumed physiologic changes within the brain/brainstem relative to the amount and duration of musical training.14,15 We hypothesized that the processing mechanisms for active musicians become increasingly more efficient over time, due to training. Therefore, this group can focus more mental resources on the retention of sound information during pitch perception tasks of varying difficulty. Sixty-six participants, in three different age groups (i.e., 10-12 year olds; 13-15 year olds, and adults), completed two experiments. 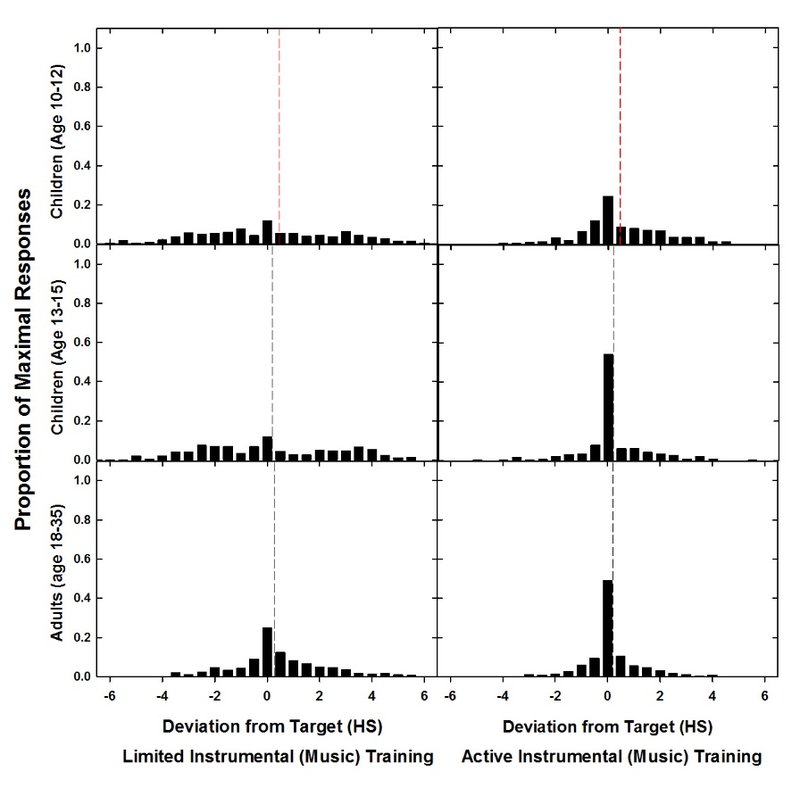 The first experiment included a measure of non-verbal auditory working memory (pitch pattern span [PPS]).16 The second experiment used a pitch matching task, which closely modeled the procedure implemented by Ross and colleagues.17-19 Figure 1 displays the individual PPS scores for each instrumental training group as a function of age in years. The second experimental task, a pitch matching production task, eliminated the typical need to understand musical terminology (e.g. naming musical notes). This method provided a direct comparison of musicians and non-musicians, when they could only rely on their listening skills to remember a target, and to match the pitch to an ongoing tonal sequence.17-19 We wanted to evaluate pitch matching accuracy (via constant error) and consistency (via standard deviation) in individuals with limited and active instrumental musical training. Figure 2 illustrates the timing pattern and describes the task procedure. Each participant completed thirty pitch matches. 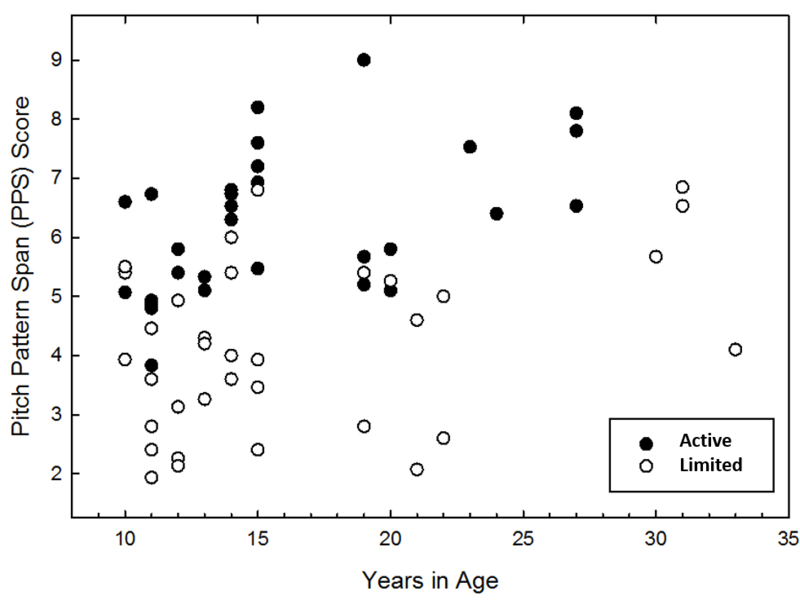 Figure 3 depicts distribution of responses across age groups and instrumental training groups (see figure legend). Statistical analyses (i.e., Manova and Linear Regression) revealed that duration of instrumental musical training and age uniquely contribute to enhanced memory for pitch, indicated by greater PPS scores and smaller standard deviations of the pitch matches. Unexpectedly, based on the task procedures where participates are equally likely to match a pitch above or below the target, the youngest children (ages 10-12) demonstrated significantly sharper pitch matches (i.e., positive constant error) across pitch matches than the older participants (13 and older; see Figure 3 dashed lines). That is, across music groups, the youngest participants on average tended to produce sharper pitch matches than the presented target pitch. Matching individuals in age groups, with and without active musical training, allowed the comparison of the unique contributions of age and duration of music training on pitch memory. Consistent with our hypothesis, individuals with active and longer durations of musical training produced greater PPS scores and performance on pitch matching was less degraded (i.e., produced smaller standards deviations across pitch matches) than age-matched groups. Most individuals can distinguish pitch changes in half note steps, although they may have considerable difficulty establishing a reliable relationship between a frequency and its note value.20,21,23,24 There are individuals, however, with absolute pitch, who have the capacity to name a musical note without the use of a reference tone.24 While no participant in either music group (Active or Limited) reported absolute pitch, two participants in the active music group matched all thirty pitch matches within 1 semitone; that is, within one half step (HS) of the target. This may indicate that the two listeners were using memory of the categorical notes to facilitate pitch matches (e.g., using their memory of the note A4, could help when matching a target pitch close to 440 Hz in the task). Consist with previous application of this method,17,18,19 the pitch matching production task did identify participants who possess similar categorical memory for tonal pitch when musical notes and terminology were removed from the production method. Figure 1. Individual PPS scores (y-axis) for each instrumental training group as a function of age in years (x- axis). The participant scores in the active group are represented by filled in circles, and the participants with limited instrumental training are open circles. Figure 3. Displays the proportion of response matches produced as a function of the deviation in half-steps (smallest musical distance between notes, e.g., progressively going up the white and black keys on a piano) across age groups in rows (ages 10-12 years, top; ages 13-15 years, middle; ages 18-35 years, bottom) and instrumental training groups by column (Limited, left; Active, right). The dashed line depicts the overall accuracy (i.e., constant error) across pitch matches produced by each participant subgroup. Schellenberg, E. G., & Trehub, S. E. (1996). Natural musical intervals: Evidence from infant listeners. Psychological Science, 7(5), 272-277. Fujioka, T., Ross, B., Kakigi, R., Pantev, C., & Trainor, L. (2006). One year of musical training affects development of auditory cortical evoked fields in young children. Brain, 129(10), 2593-2608. Morrongiello, B. A., & Roes, C. L. (1990). Developmental changes in children’s perception of musical sequences: Effects of musical training. Developmental Psychology, 26(5), 814-820. Strait, D., Kraus, N., Parbery-Clark, A., & Ashley, R. (2010). Musical experience shapes top-down auditory mechanisms: evidence from masking and auditory attention performance. Hearing Research, 261, 22-29. Williamson, V. J., Baddeley, A. D., & Hitch, G. J. (2010). Musicians’ and nonmusicians’ memory for verbal and musical sequences: Comparing phonological similarity and pitch proximity. Memory and Cognition, 38(2), 163-175. doi: 10.3758/MC.38.2.163. Schön, D., Magne, C. & Besson, M. The music of speech: Music training facilitates pitch processing in both music and language. Psychophysiology 41, 341–349 (2004). Kraus, N., Skoe, E., Parbery-Clark, A. 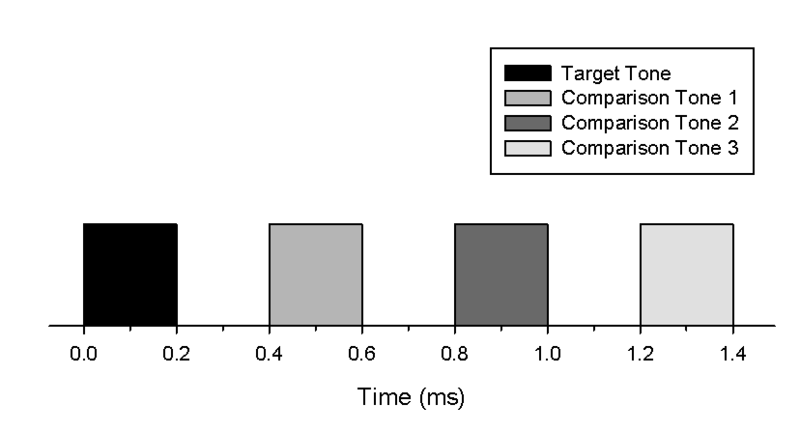 & Ashley, R. Experience-induced Malleability in Neural Encoding of Pitch, Timbre, and Timing. N. Y. Acad. Sci. 1169, 543–557 (2009). Banai, K., Sabin, A.T., Wright, B.A. (2011). Separable developmental trajectories for the abilities to detect auditory amplitude and frequency modulation. Hearing Research, 280, 219-227. Dawes, P., & Bishop, D.V., 2008. Maturation of visual and auditory temporal processing in school-aged children. J. Speech. Lang. Hear. Res. 51, 1002-1015. Moore, D., Cowan, J., Riley, A., Edmondson-Jones, A., & Ferguson, M. (2011). Development of auditory processing in 6- to 11-yr-old children. Ear and Hearing, 32, 269-285. Morrongiello, B. A., & Roes, C. L. (1990). Developmental changes in children’s perception of musical sequences: Effects of musical training. Developmental Psychology, 26, 814-820. Habib, M., & Besson, M. (2009). What do musical training and musical experience teach us about brain plasticity? Music Perception, 26, 279-285. Ross, D. A., Olson, I. R., & Gore, J. (2003). Absolute pitch does not depend on early musical training. Annals of the New York Academy of Sciences, 999(1), 522-526. Levitin, D. (2006). This is your brain on music: The science of human obsession. New York, NY: Dutton. Moore, B. C. J. (2003). An introduction to the psychology of hearing. London, UK: Academic Press.